Worked commenced on the airfield at Manby in the mid-1930s, as part of the first phase of the RAF Expansion. Along with the normal airfield design, Manby was to be the first airfield in Lincolnshire to have a paved runway, which for some reason was camouflaged immediately upon completion. Although the airfield was not officially opened until 1938, it was in use the year before for testing of an experimental cross-wind landing screen. The screen was made up of a steel framework which measured 50ft high and 500 yards long. The idea was to help protect landing aircraft from the harsh cross-winds the airfield suffered from with being on the edge of the Lincolnshire Wolds. Trialling of the new screen were to take place over a two month period in August and September 1937. So a number of different aircraft types were brought in for the trials including a Fairey Battle, Armstrong Whitworth and a Bristol Blenheim. More trials were held later in year, but by February 1938, with RAF Manby about to open, the decision was made to dismantle the screen and move it elsewhere. The airfield officially opened in August 1938 and within days had its first residents, No.1 Air Armament School, which had arrived from RAF Eastchurch. The role of the AAS was to train Armament Officers, Air Gunners and Air bombers so extensive use was made of the nearby bombing ranges on the coast. 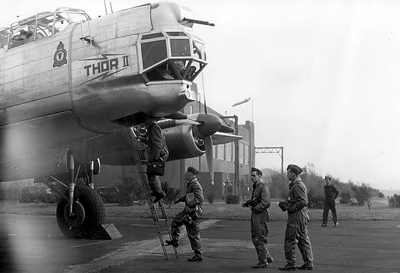 Training at the airfield by the AAS was not restricted to solely RAF personal. They were responsible for training many personnel from many Allied air forces, some as far away as Turkey. By the time war was declared on Germany in September 1939, the station was home to a variety of aircraft including Hawker Harts, Hawker Hinds, Hawker Furies, Wallace and a single Boulton Paul Overstrand. By the end of the year they had been joined by Gloster Gauntlets and several Hawker Henleys. By June 1940, Manby housed the Joint Services Bomb Disposal School. The JSBDS was made up of Royal Engineers and Royal Navy demolition parties being trained alongside their RAF counterparts. In August 1940 due to the increased workload generated by the war, twenty five more mobile bomb disposal squads were formed. By the summer of 1940 it became apparent that airfields all over Lincolnshire were in need of defences, due to the increased number of raids by the Luftwaffe. As a result of this defence squadrons were formed all over the county. By the summer of 1941, Manby had it’s first officially known defence squadron, No.2782, with it’s personnel manning various machine guns, 20mm cannons and Bofors. On the 21st December 1940 the defence squadron at Manby were credited with shooting down a Ju88, which shortly after crashed at South Cockerington. Unbeknown to the personnel on the ground, the Bristol Beaufighter about to intercept the Ju88 was being piloted by Flt Lt Guy Gibson. As a result of the defence squadron personnel shooting down the aircraft, Flt Lt Guy Gibson had to wait until the new year before making his first “kill” as a fighter pilot. The defence squadrons later became known as the RAF Regiment. By early December 1942, Manby had taken over the Care and Maintenance of RAF Caistor, but by the end of March 1943 it had been handed over to the Technical Training Command for use by RAF Cranwell. July 1944 saw the very successful No.1 AAS upgraded to Empire status and the Empire Central Armament School was formed. Under this new role, not only would they continue the training of Armament Officers, Air Gunners and Air bombers, but also the training of Bombing Leaders, Bombing Instructors and Armament Instructors. In addition to all this they would also now be running armament refresher courses. Due to the expansion in role new aircraft soon arrived including Avro Lancasters, Bristol Blenheims and Vickers Wellingtons. With the ECAS now having more responsibility and running more courses, it signalled a major expansion of Manby. Two new paved runways were laid to help with the increased amount courses being run. By November 1944 the name was changed again and the Empire Air Armament School was formed. In view of the change in status from the old No.1 AAS, Air Ministry Order N170/1945 changed the old No.1 AAS motto from “Knowledge Fortifies the Kingdom” to “Knowledge Fortifies the Empire”, which was more in keeping with its new role. With the end of WWII the RAF began to run down numbers of aircraft across the various airfields, Manby included. But in late September 1945, Avro Lancaster (PB873) arrived at the airfield in preparation of an EAAS mission to India. This aircraft was subsequently named “Thor” by the wife of the then Station Commandant. However the mission to India was changed, and instead the aircraft went on to do a tour of the Middle East in October, followed by a tour of Australia and New Zealand in March 1946. 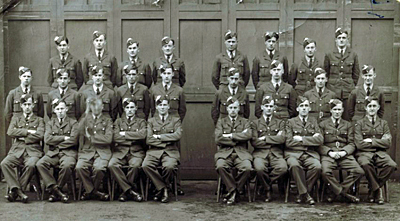 On 1st July 1949, Manby saw the The RAF Flying College formed. They operated a very mixed fleet of aircraft including Avro Lincolns, Vickers Valettas, de Havilland Vampires and Avro Athenas. By 1950 the Handley Page Hastings had also been added to the inventory. Along with the Hastings, the RAFFC also inherited the “Aries” aircraft from the Empire Air Navigation School. One of which was the “Aries III”, this aircraft being a Avro Lincoln (RE367) which was not only flown around the world in 130 hours, but also flew to the North Pole in just 18 hours. During the same month Manby also saw the formation of the RAF Handling Squadron. The purpose of this Squadron was to assess the handling qualities of second or third models of new aircraft. The English Electric Canberra, de Havilland Sea Vampire, Grumman Avenger and Supermarine Attacker were just a few of the aircraft to have spent time with the Squadron at Manby. On 15th October 1954 an English Electric Canberra B.2 (WH699) from the Squadron became the first jet aircraft to have flown over the North Pole. March 1951 saw the Headquarters of 25 Group reformed at the airfield to control all the new Advanced Flying Schools, which were being formed during an expansion of the RAF. By the end of the year, 25 Group were operating Gloster Meteors of various Mk’s from the airfield. Their Headquarters remained at Manby until February 1961. By the end of 1960 the RAF Flying College had been split between two airfields. RAF Strubby was now handling jet aircraft flying as it was more suited to the aircraft, and Manby was handling piston-engined aircraft. This included the Vickers Varsities and Percival Provosts. June 1962 saw the RAFFC renamed; now becoming the RAF College of Air Warfare and the School of Refresher Flying. No new aircraft were added to the CAW until 1964 when the piston Provosts were slowly replaced by the Jet Provosts. But by the end of April 1965 the last Meteors and Varsities had left the airfield, leaving the Canberra as the main training aircraft. The CAW continued to use the Canberra for navigation training until 1966. But by this time the Hawker Siddeley Dominie had arrived at the station, and the Canberra finally departed in December 1966. During 1965, the CAW decided to form their own display team using the Jet Provosts already under their control. “The Magistrates” as the team was originally called displayed for three seasons before changing their name to the “Macaws”. The name represents the unit that they operated from, MAnby Collage of Air Warfare. The newly named team had a unique colour scheme of light grey and red for their debut season in 1968. This was after having a standard silver and day glow training colour for the previous three seasons. The team flew six basic formations for their display and finished it with a “Petal Break”, or as it’s known now a flat bomb burst. The team made their final display in November 1973, led by Flt Lt Peter Diggance. With the closure of RAF Strubby in 1972, Manby received their Dominies and moved the Varsities on to RAF Oakington. But by now rumours were rife that Manby was also on the list of airfields to close. The rumours proved to be true and the station officially closed on 31st March 1974. 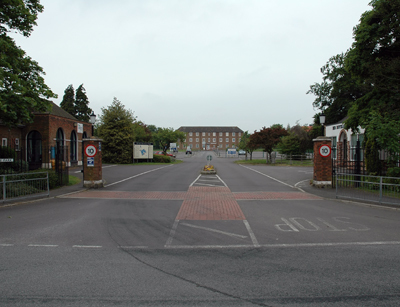 After the closure of the airfield as a military base, sections of the housing came under the control of RAF Binbrook, as was initially used to house personnel from there. But over the following years more and more of the airfield was slowly sold off to the private sector. Culminating in 1978 with part of the domestic site, including the former MT section, being sold off to the Lincolnshire County Council, who still occupy the site to this present day. More sections were sold off in July 1980, when a large chunk of the airfield itself including most of the runways, taxiways and the two control towers were put to auction. Today the former RAF Manby is a thriving Industrial Estate and many of the old buildings including the control tower are still visible today. Most of the C-type hangars, administration buildings, messes and barracks also still survive to this day. But in 2008 it could have been a different story when the former RAF site was proposed by East Lindsey district council as a possible location for an eco-town of 5000 homes. It appeared on a government shortlist of ten sites, however after protests from residents the council voted to withdraw the plan. Instead the former Airmens' married housing has become Middlegate Meadows, an outlier of the next-door village of Grimoldby. The disused airfield over the years has been used as a showground, and is now an off-road driving centre. One of the hangars is used as a grain store as part of the European Union Common Agricultural Policy, There is also a Chieftain Tank sat at the entrance to one of the old Crash Gates on the B1200. The remaining buildings on the site are still home to a variety of different companies, keeping the the old station occupied and alive. August 1938 Station officially opened. August 1938 No.1 AAS The Air Armament School operated a variety of aircraft including the Fairey Battle, Hawker Hart, Supermarine Walrus, Hawker Demon and Vickers Wellington. The AAS was renamed the Empire Central Armament School in July 1944. July 1944 ECAS The Empire Central Armament School operated the Vickers Wellington, Avro Lancaster, Bristol Blenheim, Lockheed Hudson and de Havilland Mosquito. The ECAS was renamed after only 3 months, becoming the Empire Air Armament School in November 1944. November 1944 EAAS The Empire Air Armament School operated the Vickers Wellington, Avro Lancaster, Avro Lincoln, Gloster Meteor and de Havilland Vampire. The EAAS left Manby on 1st July 1949. July 1949 RAF Flying College The Flying College operated the Avro Lincoln, Vickers Valetta, Gloster Meteor, Avro Anthena and de Havilland Vampire. The Flying College was renamed on 31st June 1962 to the College of Air Warfare & School of Refresher Flying. July 1949 RAF Handling Squadron The Handling Squadron operated the English Electric Canberra, Gloster Meteor, Westland Wyvern, Grumman Avenger, Hawker Sea Hawk, Handley Page Marathon and de Havilland Venom. The Handling School disbanded in 1954. July 1962 RAF CAW & S of RF The College of Air Warfare & School of Refresher Flying operated the English Electric Canberra, Vickers Varsity, Gloster Meteor, BAC Piston Provost, BAC Jet Provost and Hawker Siddley Dominie. The CAW &S of RF left the airfield in December 1973. December 1973 Station placed on Care and Maintenance. 31st March 1974 Station closed.